All Saints, Margaret Street strikes one much the same way as does that enormous featured geode in the mineral gallery at London's Natural History Museum. One first confronts a rather plain, even unattractive and off-putting stone exterior in its own free-standing case that when cracked open surprisingly revealed a glittering interior — a strange assemblage of bright yellow long, drawn out, sharp pyramidal shapes. Butterfield's pioneering, controversial church offers an equally dramatic contrast between inside and outside. The Ecclesiologists who sponsored the construction of All Saints found two reasons for such marked contrasts, the first of which was that, “as the Ecclesiologist implied, the Church was a citadel-fortress; in the words of its New World offshoot, it suggested that ‘the church now finds herself surrounded by infidelity, cold faith, and unsanctified learning, and every new temple which she erects should be like Noah's ark — a protest and a warning’” (Hersey, 95). Second, “the poor themselves desired it” (95). 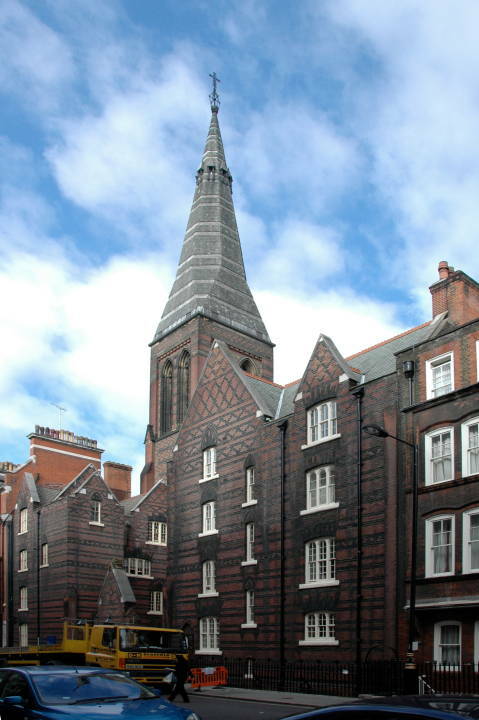 This church on Margaret Street, as Henry-Russell Hitchcock pointed out more than 40 years ago, initiated High Victorian Gothic, a virtually postmodern style that combines traditional gothic forms with untraditional ones and then adds unusual ground plans with often exciting, occasionally abrasive, effect. 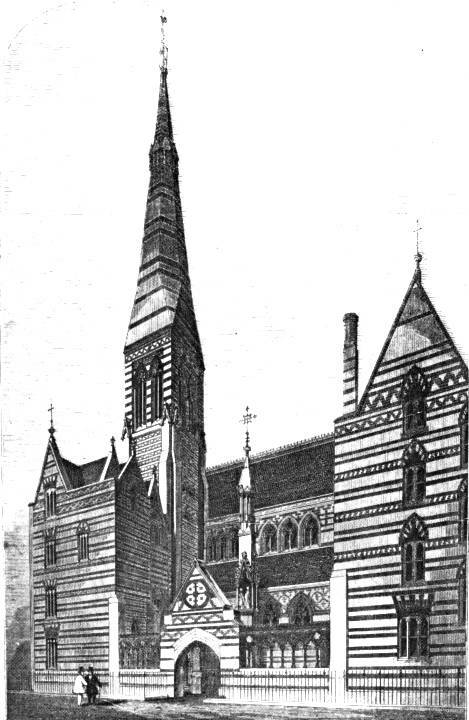 Unlike seminal churches on the continent, this one received neither major government support nor an important site on which it could dominate surrounding buildings: "All Saints', Margaret Street, designed in 1849, largely completed externally by 1852, and consecrated in 1859, was the result of no imperial fiat, like the Votivkirche in Vienna or the big churches of the sixties in Paris, nor did it occupy like them an isolated site approached by wide new boulevards." Sponsored by the Ecclesiological Society and funded privately, this path-setting church, perhaps paradoxically, was tucked in, almost hidden, in London W1. 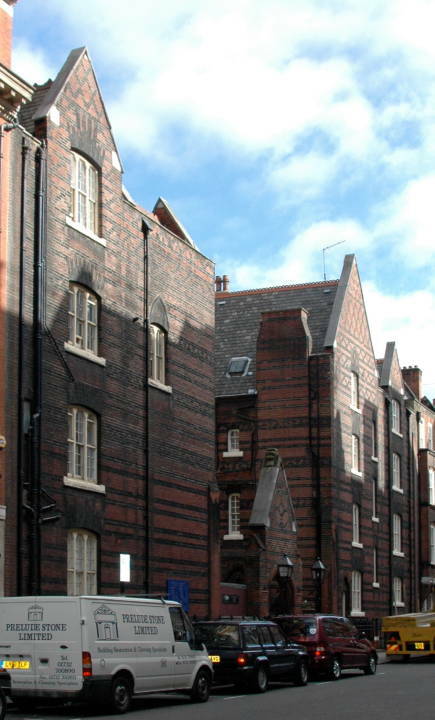 "All Saints' is set in a minor West End street at the rear of a restricted court flanked by a clergy house and a school. But for its tower, the tallest feature of the mid-century London skyline, it would have been hard to find; but once found, it could never be ignored." Occupying a rectangular site approximately 100 feet square, in the middle of the block, All Saints forms a tall, narrow U opening to the street. Along the sidewalk runs a low brick wall which at one time was topped by an arcaded iron fence. There is no foliage or grass of any sort; on the left are the schools, the master's room, and the library, and on the right the equally high but wider clergy residence, both of which are entered from the court. There is a common basement. Behind, in the southwest corner, is the entrance porch for the church proper. The south aisle and clerestory of the church form the rear of the court, and the tower rises from the western bay of this aisle, behind the schools. Hersey points out that the volumes of each part of the structure “declare themselves vertically” by ending at points that suggest their relative importance, producing an effect much like that of a bar graph. 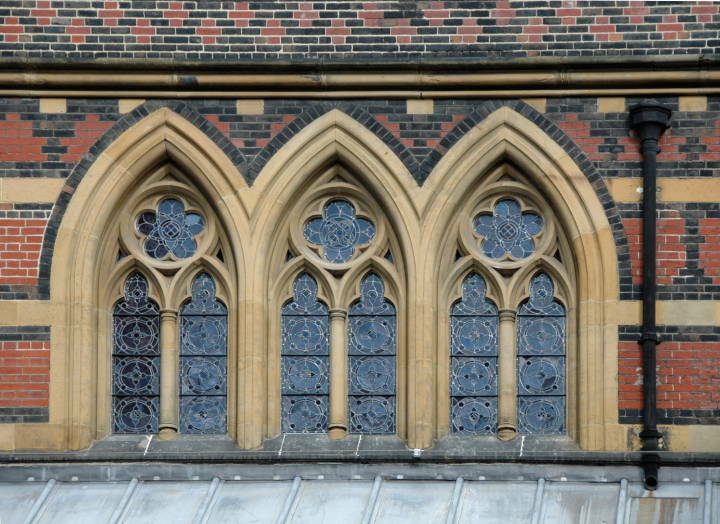 Left and right: Various gothic elements, including ogee arches. 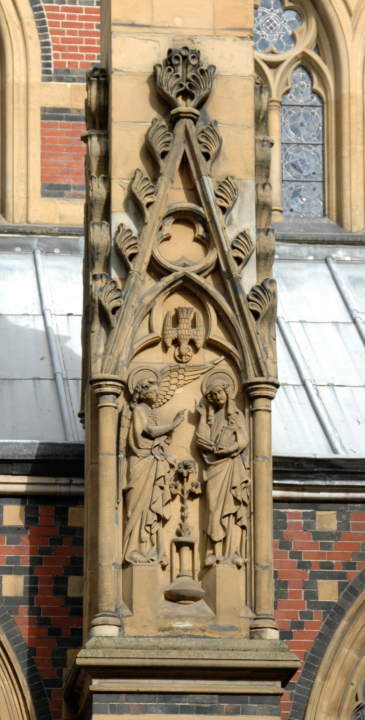 Middle: Base of the pinnacle with a bas relief of the Annunciation. 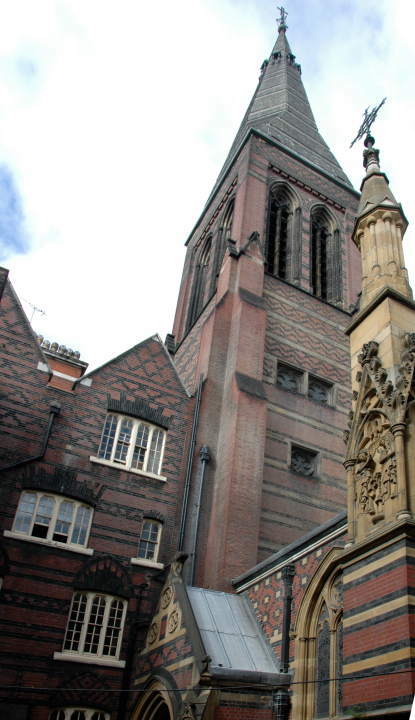 Left: Note how buildings associated with the Church contrast with the plain red brick of the butresss supporting the steeple. Right: Black diamonds on the façade and sunbursts over the windows. Entrance to the church and church wall: light colored stone contrasts with red and black brick. 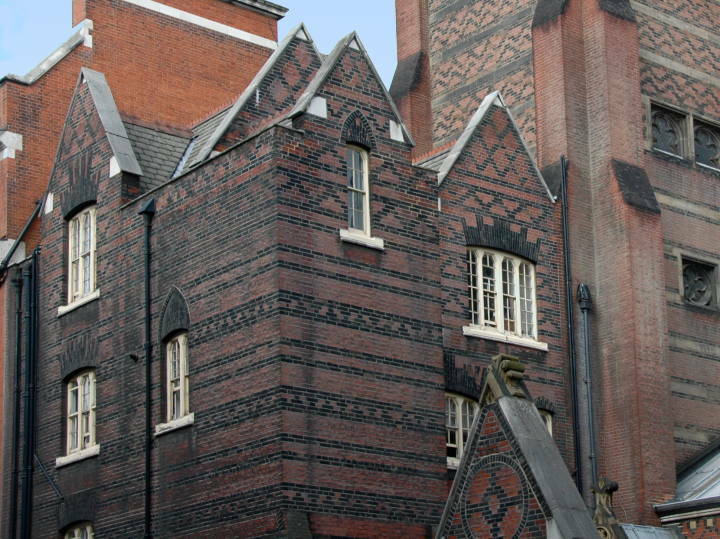 One reason contemporaries could hardly ignore All Saints, Margaret Street, lay in its radical departure from Butterfield's own earlier, more conventional Gothic Revivalism. 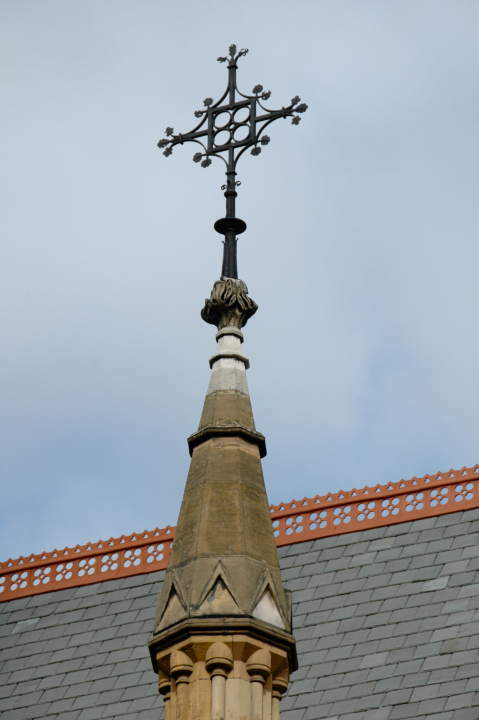 The architect of All Saints', Butterfield, had been for some years, together with Carpenter, the favourite of the ecclesiologists because of the Pugin-like 'correctness' of his revived fourteenth-century English Gothic. Now, quite suddenly, he and his sponsors embarked on new paths. 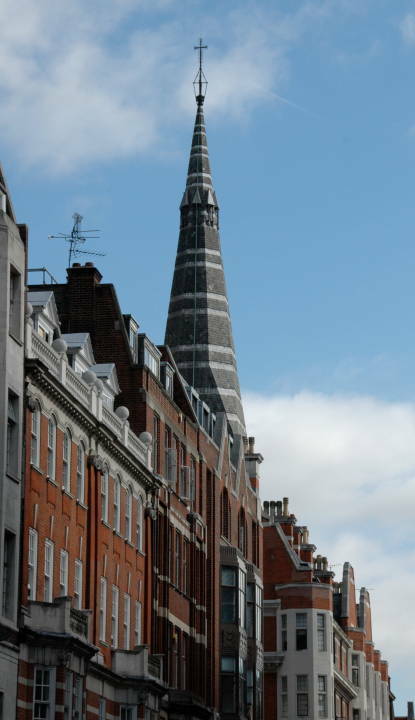 As soon as the walls began to rise, their startling character became apparent; for the church is of red brick, a material long out of use in London, and that red brick is banded and patterned with black brick, a theme varied on the tower by the insertion of broad bands of stone. 'Permanent polychrome', achieved with a variety of materials, thus made its debut here. In the interior, moreover,'the polychromatic effect was even richer and more strident, with marquetry of marble and tile in the spandrels of the nave arcade and over the chancel arch, not to speak of the onyx and gilding in the chancel itself. Butterfield's bold experiments with polychromy had major importance. 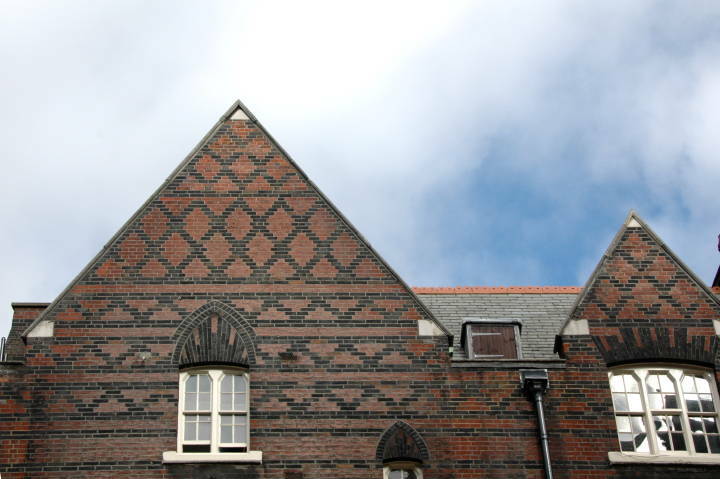 As Paul Thompson explains, “As the test case of Ruskin's theory, All Saints' in a sense influenced all the innumerable examples of constructional colour which marked the remainder of the nineteenth century spreading gradually outwards to the furthest corners of European influence and downwards through the social layers of taste” (349). 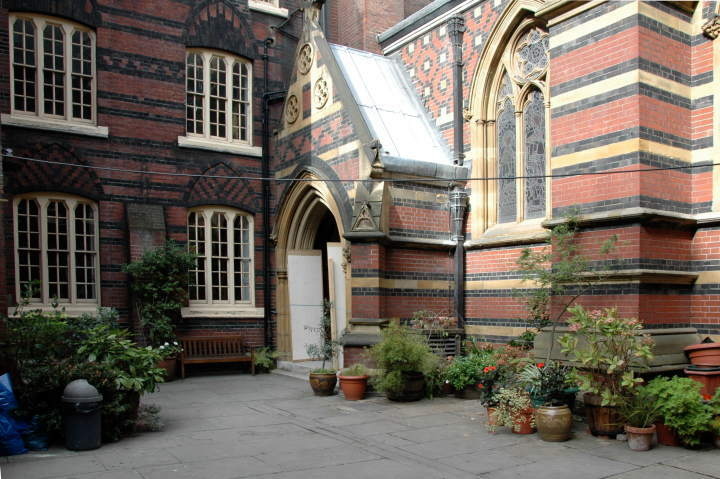 All Saints Margaret Street (1990). Foreword by Sir Roy Strong. London: All Saints Margaret Street and Jarrold Publishing. 2005. Ecclesiologist 11 (1850): 227-33 (Quoted by Hersey). New-York Ecclesiologist 4 (1852): 185 (Quoted by Hersey). Hitchcock, Henry-Russell. Architecture Nineteenth and Twentieth Centuries. Baltimore: Penguin, 1963. Kerney, Michael. 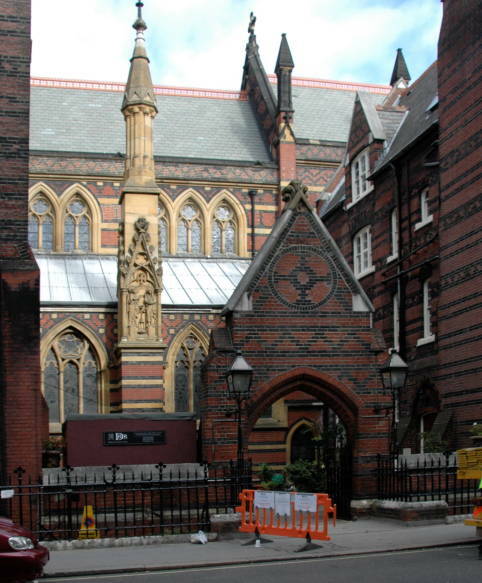 All Saints', Margaret Street: A Glazing History. Reprinted from The Journal of Stained Glass. c. 2005. Thompson, Paul. William Butterfield, Victorian Architect. Cambridge: MIT Press, 1971.